Whether Charles Dickens would approve of Oliver!, the grand musical inspired by his Oliver Twist, Carol Reed's film adaptation of Lionel Bart's stage play is a gem. Along with David Lean's own Oliver Twist and Great Expectations, it serves as one of the most joyful translations of Dickens' written word into moving pictures. In Mr. Bumble's (Harry Secombe) dreary, grimy orphanage, Oliver (Mark Lester) suffers daily the pain of eating a meager portion of gruel. One day, he arises and famously asks for more. Set to Bart's infectious music, the opening scene sets the right tone for the whole film. 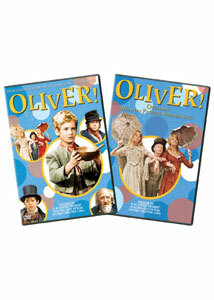 The songs Food, Glorious Food and Oliver! contain lovely lyrics and tremendous orchestration. Things only improve, both musically and in filmmaking terms, when Bumble walks the streets singing Boy for Sale. Eventually Oliver escapes from Bumble and marches to London, where The Artful Dodger (played with remarkable skill by Jack Wild), a Cockney pickpocket no older than our titular character, recruits him into Fagin's (Ron Moody) army of youthful thieves. Set in the slums of London, gorgeously recreated by production designer John Box, Fagin deals with the violent Bill Sikes (Oliver Reed) and Sikes' girlfriend, the loving Nancy (Shani Wallis). It seems that Oliver will forever be stuck in the grip of Fagin and Sikes, until he is wrongly accused of robbing Mr. Brownlow (Joseph O'Connor). Acquitted of the charges, Oliver is taken into Brownlow's custody. Living comfortably in the bosom of high society, it seems Oliver will finally get "more," until Sikes finds him and will stop at nothing to retrieve the boy, who can finger their ring of robbers. Any attempt to explain the plot of Oliver! will fail to capture the genuine thrill one experiences while watching it. Carol Reed's zestful direction, complimented by Onna White's Oscar-winning choreography, makes this a fine swan song for the epic Hollywood musical. The highlight of the film is Consider Yourself, when the whole town of London breaks into a marvelous song and dance that had me tapping my feet with a huge smile on my face. It's difficult to imagine that these Londoners are living in a slum, since they must be well nourished to pull off such a feat. Yet, it is the magical ability to move from dreary subject matter into delightful musical numbers that makes it so effective. Released in 1968, it is a far cry from the era's films that changed cinema, but while 2001: A Space Odyssey is more important, Oliver! is far more enjoyable. No member of the cast stands out, this being an ensemble in the best sense of the word. Ron Moody's Fagin is inviting, somewhat askew, and deeply touching. Watch his performance of Reviewing the Situation to see a great acting in song. Shani Wallis is quite believable as a woman stuck in a terrible life who takes a motherly love to Oliver. In the title role, Mark Lester does well, despite not quite selling his singing. The music for Where Is Love? is beautiful, but his high-pitched voice is somewhat discordant. Oliver Reed makes for an excellent villain, exhibiting a seductive, chilling physical power. Kudos must also be given to the team of dancers, especially the young boys playing Fagin's bandits, who pepper the film with truly dazzling physical movements. Even if you're not a fan of musicals, the production values on display here are so triumphant that the movie merits a viewing. Oswald Morris' cinematography is loaded with energy and Phyllis Dalton's costumes are exquisite. Watching Oliver! again, I realized that I'd forgotten how good it truly is. The visuals, music, and impeccable sound mix are enthralling. It didn't change filmmaking like many of its contemporaries did, but Carol Reed's musical reminds us that classical Hollywood cinema is a delicious treat. Image Transfer Review: The film is shown in its original aspect ratio of 2.35:1 on a DVD-18 disc. The first side contains everything prior to the intermission, while the rest is on the second side. The picture is nothing extraordinary, but still works. The overall image is slightly soft and grainy, but not distractingly so. Detail is mostly impressive, colors are accurate, and depth is commendable. Print defects are noticeable, but not exceptionally frequent. Audio Transfer Review: The Dolby Digital 5.1 mix is extremely front heavy, yet this doesn't bother me. Sound separation is minimal and I didn't notice any directionality. The major London scenes and Oom-Pah-Pah engage the rear-channels, but otherwise the sound is spread across the front soundstage. While it's not a dynamic mix, it's clean, audible, and seemingly faithful to the original theatrical experience. There's also a French Dolby Stereo 2.0 mix available. Photo Gallery�a collection of various still photographs, containing captions with information about the production. Soundtrack CD�the film's original soundtrack album, featuring all 14 songs. Extras Review: Extras are fairly limited, with either side of the DVD offering the same three supplementals. The film's original theatrical trailer is shown in nonanamorphic 2.35:1 widescreen and the picture is not too terribly different than the movie's anamorphic image. There's also a 1968 Featurette (07m:32s) containing footage from the set and a narration explaining the various production designs. Director Carol Reed can be heard in some audio bytes, but this is largely a promotional piece that offers little in the way of information. Finally, on the DVD there is a Photo Gallery that has different pictures of the sets, cast, crew, and posters. Each picture is accompanied by a caption that either tells who's who or provides some tidbits about the production. The new addition to this Oliver! : Special DVD & CD Set is, obviously, a CD containing the movie's songs. All sound quite good. It's a nice compliment to the film. Nonetheless, the special features are lacking a bit. Oliver! is a staggering experience, thanks to its gifted cast and crew. This new gift set contains the original DVD Columbia released, but also a newly released soundtrack containing all 14 songs. It's not a powerhouse set, but still worth a purchase for the wonderful movie.